To read the original, complete history, click here. Beginning in the late 1940s and continuing into the early 1950s, twelve Jewish Leesburg business people and their families met at each other's home for Friday night Sabbath Services. Later, Shabbat services, holiday festivals and High Holiday services were held at various locations in downtown Leesburg. By 1953, the need for a stand-alone Temple building was recognized and committed to by the Congregation members. Early that year, because of the strength of warm inter-community relationships between the Temple member merchants on Main Street and the Leesburg area Christian and African-American communities, $5,000 was received from public solicitations in $5 and $10 contributions. The Temple bought a plot of land at 13th and Center Streets in Leesburg. On August 11, 1954, ground was broken to begin the construction of "Congregation Beth Sholom of Lake County", the first Jewish synagogue in Lake County. The Temple Sisterhood raised money from rummage sales to furnish the new building. A $4,000.00 shortfall on the roof construction was underwritten by loan from a local bank, for which five Jewish business leaders personally signed a note. The Sisterhood held further sales to pay off the note. Members of the local community had voluntarily assisted in some of the construction work. In the fall of 1954, after five weeks of construction, Congregation Beth Sholom opened for Rosh Hashanah Services. "Rabbi" Getzel Mularsky, one of the Temple founders, a Dachau Concentration Camp survivor and owner of a local dry goods store known as Getzel's, conducted the New Year Services. Mr. Mularsky had studied for the rabbinate in Europe, but was never formally ordained. His training served him and the congregation wonderfully as acting Rabbi. He continued conducting religious services for fifty (50) years until his death in December 2004. As the years passed into the 1960s and '70s, the area Jewish community grew with the addition of numerous retirees moving down from the US North and, later, others moving north from Southern Florida. 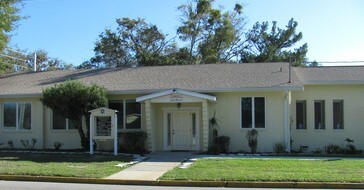 The current Social Hall was added through a donation of Manfred Kohn, another Holocaust survivor, in honor of his wife. After several years with the services of interim rabbis, Rabbi Karen S. Allen, became the new Rabbi of Congregation Beth Sholom in July 2008. Sabbath Services are conducted twice a month together with holiday festival services and the High Holiday Services of Rosh Hashanah and Yom Kippur.